Following our recent printed newsletter mail out, there are a number of readers who have asked to be added to the "e-news" distribution list. Hopefully, I have entered all details correctly- if there is an error please let me know. of the weather and road closures! A 7 day outback trip to Coober Pedy, Painted Desert and William Creek departs 28th September, so will be kept fairly busy over the next few weeks! I thank you for reading our newsletters, and trust you will continue to find something of interest! 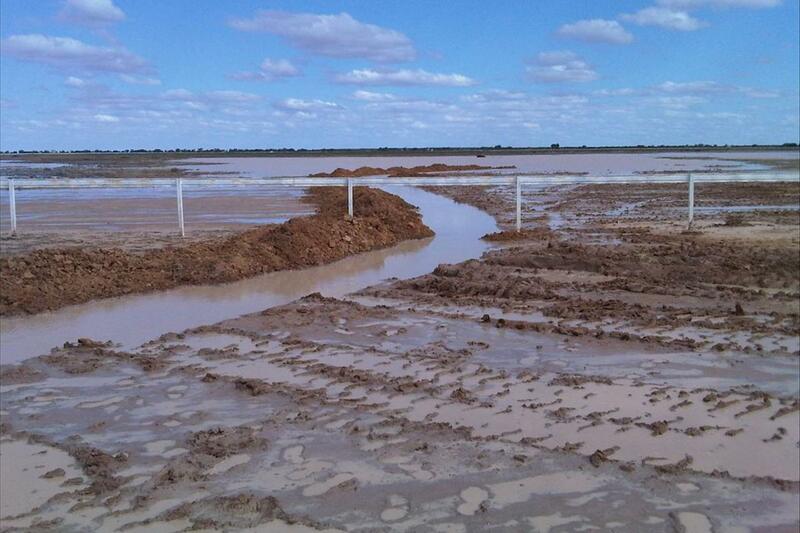 ABC Radio has some great photos from Birdsville at the time of the Races last weekend. 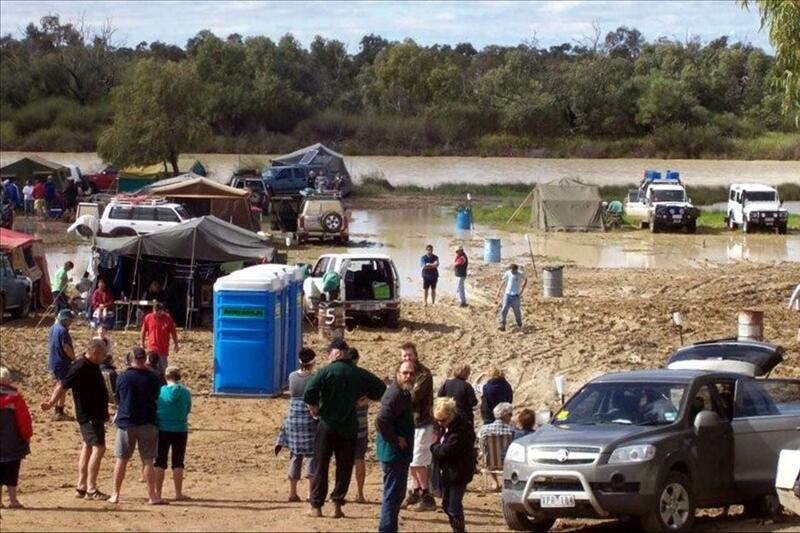 The first is of race goers camped on the banks of the Diamantina during the race weekend. A wider view here. There were approximately 5,000 people camping around the town!! 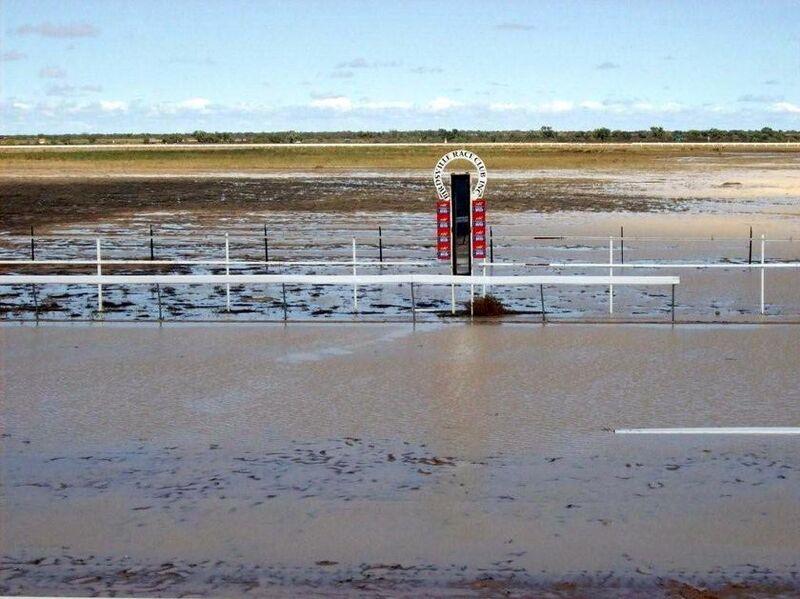 The amount of water lying around the track can been seen in this photo of the finish post and the channels which were made around the race track to divert the water. 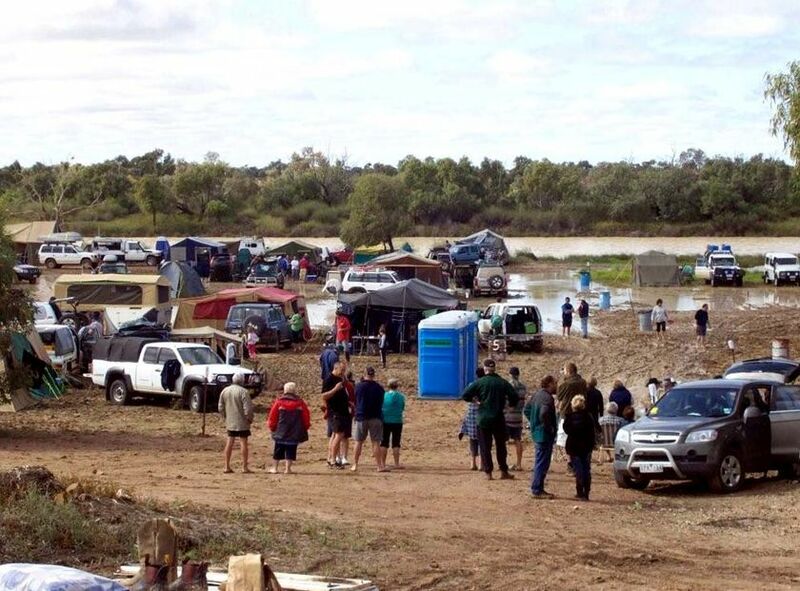 I mentioned in the printed newsletter about our recent Birdsville trip, and the great experience of taking the ferry at Cooper's Creek on the Birdsville track. Here is a very interesting aerial photo of the ferry taken 3rd August. The ferry is accessed via a 30km detour just past Etadunna Station. Ok - yes we like showing off our new vehicle! 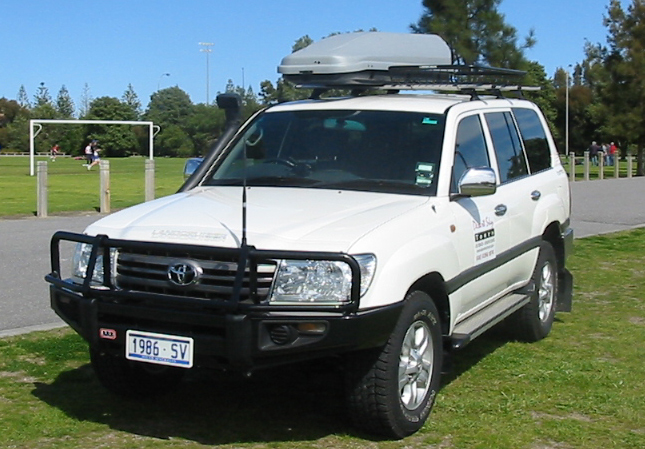 It is a Toyota Landcruiser 100m series 2006 and was purchased at the end of July from the Gold Coast. 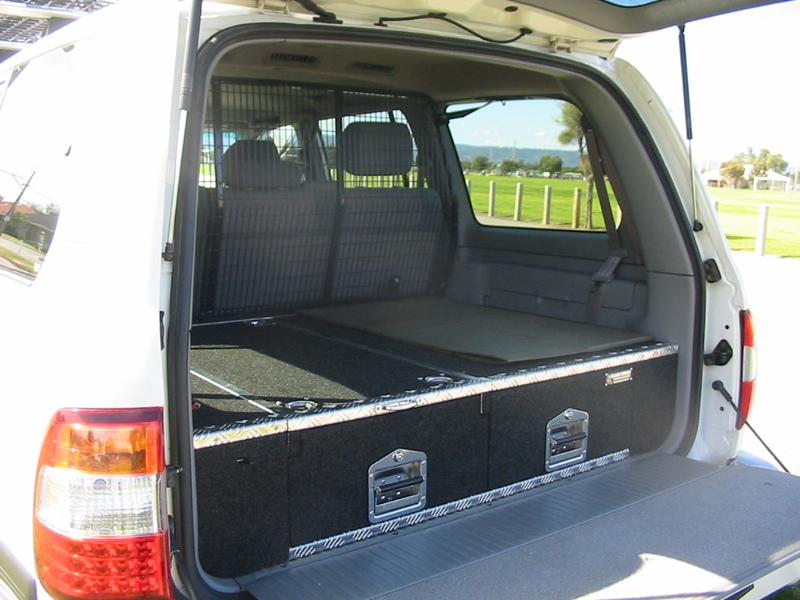 The vehicle is fitted was fitted at ARB Elizabeth SA with a "Black Widow" storage system in the rear which keeps things very tidy and easy to get to - (including the morning tea box!!). 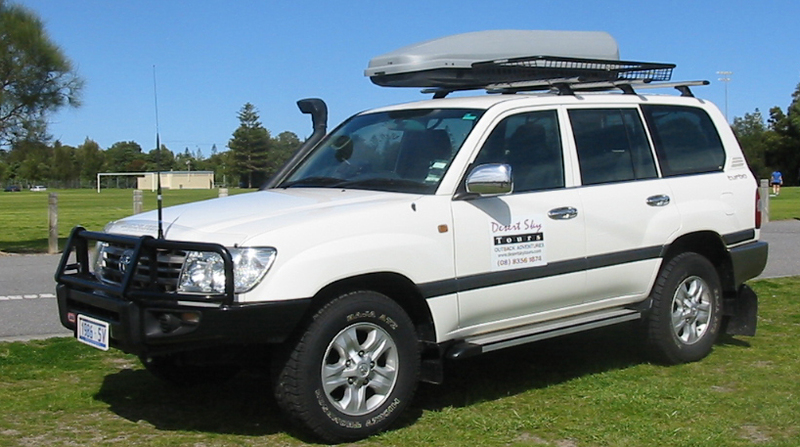 The original Dunlop Grandtrek tyres have been replaced with Mickey Thompson ATZ5-ribs which from early indications are ideal for the areas we go through. It certainly handled well on the Birdsville trip in the rough Sturt's Stony Desert, the muddy Birdsville Track and sandy areas north of Innamincka. John Menzies runs the Birdsville Working Museum, and we caught up with him again on our recent Birdsville trip. He is not doing his full "tours" anymore, but is still keen to show a few of his select items such as the cardboard gramophone and his water pumps. Whilst many people have met him through his working Museum, only a few know of his background.The following facts are taken from an article by Vic Widman in The Overlander 4WD magazine. John was born in the Sydney suburb of Yagoona in 1946 at a time when he he says he could ride his horse across the Hume Highway.At the age of seven he wasn't into comics like the rest of his school mates., he found Hoofs and Horns more to his liking and dreamt of the day when he could go to work on the land. That day came when he turned 15 and set off on his own to outback NSW where he worked as a drover and rouseabout around Bourke. Between the 1960's and 1980's he worked throughout the Channel Country, the Barkly Tableland and the Kimberley on numerous Outback stations as a drover, wheelwright, fencer and rouseabout. He became an excellent wheelwright learning from men who spent their life travelling the stock routes of outback Australia. He used his skill to advantage on repairing old Cobb and Co coaches in Charleville before settling in Birdsville in 1952. Always a collector and lover of Australian artefacts, he soon found he had enough bits and pieces to actually open a museum, combined with his leather and wheelwright/coach restoration. 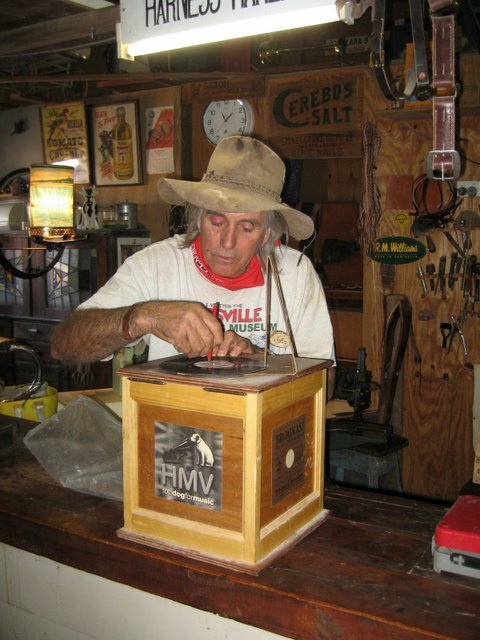 Every summer he would tour all over Australia collecting more items for his museum. The collection has grown to over 10,000 pieces with everything from roadside signs, to early medical instruments, plates and mugs of all kinds, toys, oil drums and even petrol bowsers and his cherished cardboard gramophone. Outside the big iron shed is his perfectly restored Cobb and Co coach with leather springs. He built the coach by hand. The museum and the 5 acres on which it sits overlooking the Diamantina billabong is up for sale. John has already found his retirement home - a nice little cottage in the Queensland town of Isisford. As John says, he's not getting any younger and at the age of 64 it is time to retire. 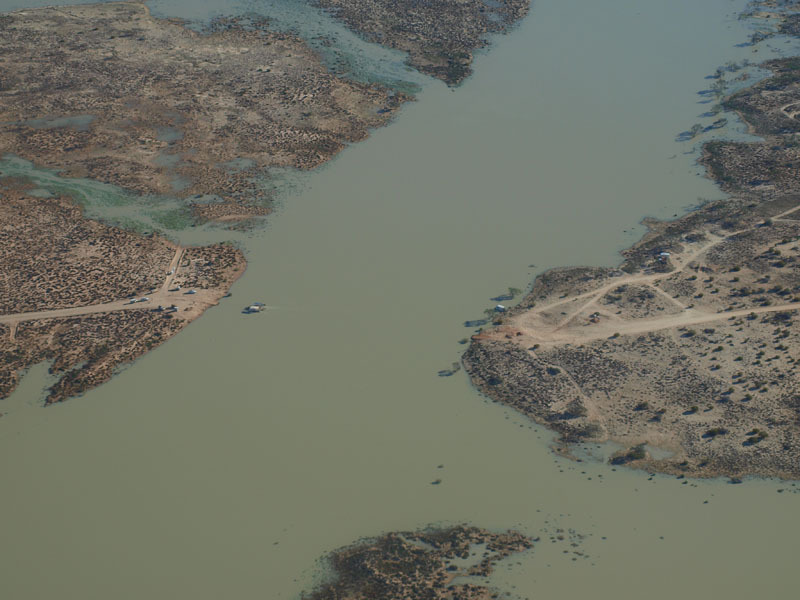 You will see from our list of trips below, we are offering a 3 day trip to view the water in Lake Eyre. The itinerary is designed for those wishing to to see the Lake without "add -ons" to other destinations. We travel through the southern Flinders Ranges to Copley - and the Copley Hotel which is our "base for 2 nights". A day trip to Marree provides opportunity for an hour and half plane flight over Lake Eyre to the Warburton Groove with Wrightsair. The package cost is $850 pp and this includes all meals, accommodation and the plane flight. There is no better value anywhere! We have 2 seats available on the 18th October departure. Ardrossan, Edithburgh, Innes National Park, Warooka, Wallaroo, Alligator Gorge, Melrose, "Bridle Track", Pt Germein. Pt Augusta, Woomera, Andamooka, Coober Pedy, William Creek, Mound Springs, Marree, Blinman, Brachina Gorge, Bunyeroo Valley, Wilpena Pound, Clare. Clare Valley, Southern Flinders, Copley, Marree, Farina ruins, Ochre Cliffs. 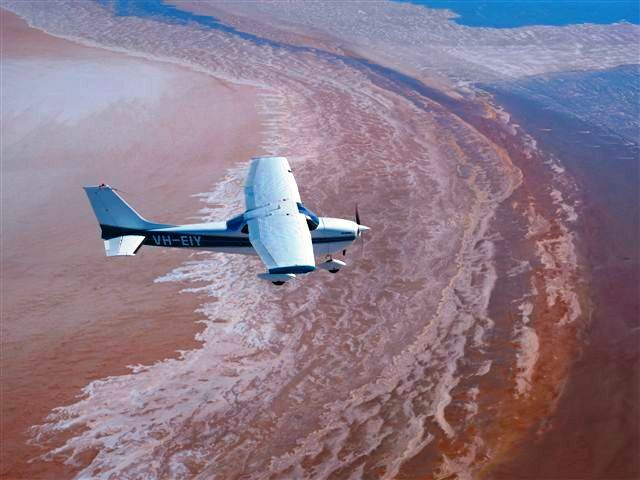 INCLUDES Hour and half flight over Lake Eyre with Wrightsair. Return through Gilbert Valley. Pennehaw, Antechamber Bay, Cape Willoughby, American River, Kingscote, Flinders Chase National Park, Cape Borda, Admirals Arch, Cape De Coudic, Seal Bay, Emu Bay, Stokes Bay, Snelling Beach, Western River Cove. Gilbert Valley,Terowie, Peterborough, Franklyn, Ketchowla, Dare Hill, Mt Bryan, Clare Valley.